Urban planning is a field that combines environmental sustainability, social equity, and intelligent design in a cohesive way. See below for some examples of research and interrogation. Anneli’s master’s thesis, completed at the Royal Institute of Technology (KTH) in Sweden, detailed how the current housing crisis in Stockholm affects the emotional, financial, and material wellbeing of young people’s lives. An abbreviated version has been published in the Swedish planning journal PLAN, available for order. Research done for Transforming Urban Transport (TUT) project at Harvard's Graduate School of Design. Click on the button below to learn more on the TUT website and read the case study. Designs for Haninge, a suburb in the greater Stockholm area, for an urban design studio course. The design focuses on harnessing the local water sources through a canal system to better service the area. Aerial view of new urban design with canals, bike lanes, and urban courtyards including greenhouses. 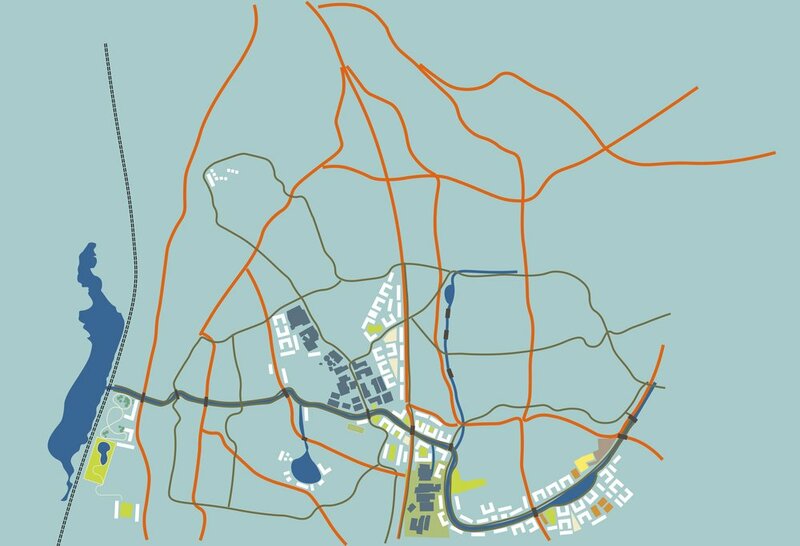 Larger view of how the expanded transport network (including extensive bike lanes and reduced car lanes) would integrate with the new canal system, new dwellings, and refurbished industrial buildings (in blue).